You are here: Home / Basketball / What’s been working for the Sacramento Kings? When Vivek Ranadive took over the Sacramento Kings ownership in 2013 the team had been at the forefront of NBA failure. Having missed the playoffs for seven straight seasons prior to his arrival, Ranadive inherited a corpse of an NBA team that had been unable to recreate the royalty of the Chris Webber years. Coaching turnover and player incongruities kept the Kings from reaching anything more than mediocrity. The scoring talent not yet heard around the league named Isaiah Thomas was never given full autonomy over the Kings back court and thus, never really had a run at forming a one-two punch with DeMarcus Cousins. Add to that undeveloped potential Ranadive’s hiring, and subsequent firing, of head coach Mike Malone and the Kings were without a centralized focus that could lift the team out of the trenches. Prior to his Kings tenure, Ranadive had an ownership stake in the Golden State Warriors. He hired Malone, then a Warriors assistant coach, on the premise that he’d be the defense-first coach the Kings needed, only for it to blow up in his face. Since that rocky start however, Ranadive has helped usher in a new, Sacramento centric philosophy. He hired Vlade Divac as the team’s vice president and later general manager in 2015, and the Sacramento legend has given an air of conviction to Sacramento’s roster moves. Divac was unflinching in trading Cousins to the New Orleans Pelicans in 2017, going so far as to bet his career on the move’s success. Coupled with the birth of a new Arena, the Golden 1 Center, as well as this season’s hot start, and the Kings are starting to piece together a formula for winning in the West. Currently 8-7, Sacramento has embraced a new tone in 2018-19. The Kings are playing at the second fastest pace in the league this season after having been the league’s slowest team in 2017-18. They are getting to the free throw line more often and boast the second highest 3-point percentage in the league. But just as important as the system, is the growth of the Kings roster. Sophomore guard De’Aaron Fox, if at times reckless, is helping to lead the charge in modernizing Sacramento’s play. Team defense could use an improvement—though the Kings are only giving up 108 points per 100 possessions, which is an improvement over last year’s 110 defensive rating. But Sacramento is finally starting to piece together its identity in the NBA: a fast-paced team that takes smart 3s and can convert in transition. Fox grew into a starting point guard for this year’s campaign, injecting his full-steam ahead style of play into the game from the jump. Freed from the chains of Zach Randolph’s plodding pace, Fox is pushing the limits of both his play and that of his teammates. Though he has developed a respectable jumper and is shooting 41 percent on about three 3s per game, Fox’s bread and butter remains his downward momentum. He is third among all sophomore players in drives per game, attacking the rim 11 times per game while shooting 54 percent on such attempts. That places him ahead of standout players like Ben Simmons and Jayson Tatum who have become synonymous with the craft. Fox’s predisposition to push the pace offensively has bled into the rest of the team, which is fifth in the league in points off turnovers. Rather than deferring to Fox and resetting the play after tracking down a loose ball or steal, the entire Kings roster is off to the races. Despite his blazing speed, Fox excels on the drive because of his willingness to change pace and absorb contact. When he creates for himself, he knows well enough to control his dribble and keep an eye towards splitting defenders. And when he pushes the break, Fox has a handle on probing the defense past the 3-point line to keep options open from trailers, like Iman Shumpert. Offensive developments like these have also helped the Kings craft a style all their own. Beyond the arc, the Kings show discretion when shooting triples. Though they have the league’s second-best 3-point percentage at 38.5, Sacramento shoots a modest 27 3s per game. This sits closer to the strategic use of 3s from the Warriors (29 per game) than the trigger-happy league leaders in attempts in Houston, Milwaukee and Boston (42, 40 and 37 attempts per game, respectively). 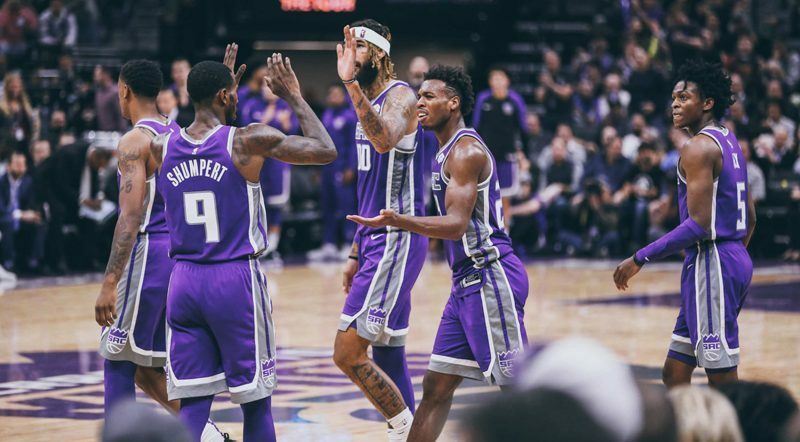 Adding Willy Cauley-Stein’s offensive outburst to the increasingly lethal scoring from Buddy Hield and Fox has granted the Kings something of their own big 3, and allows shooters like Shumpert, Bogdan Bogdanovic and Nemanja Bjelica to limit their heavy lifting. The other side of the rock is more concerning, with defensive limitations being more a problem of rotations than an explicit need for defenders. Despite his collegiate misgivings, rookie Marvin Bagley III is growing in his interior capabilities, using his solid footwork to track down and recover from blocks. Like rookies in the past, Bagley can lose sight of his man or get tangled up in switches, as he did while guarding Nikola Mirotic last month. But his continued growth with regards to his defensive IQ will work nicely with his already capable athletic ability. What’s more concerning is the difficulty Cauley-Stein and Bjelica have on closing out on defense. Despite Cauley-Stein’s offensive energy, he can get caught with his hands down in the restricted area. And Bjelica, who slots in as a starting forward, has the not-so-unique opportunity to fall into the Ryan Anderson class of stretch-fours who give up more points than they put out. Sacramento’s start has cooled off since rattling off five straight wins through the end of October, but the makings of a team that can compete in the West are there. No longer hampered by the emotional tirades of DeMarcus Cousins or the snail’s pace veteran ways of last season, the Kings are coming to define themselves as a competitive squad, responsive to a bright, young leader and with 12 seasons of failure to rewrite. Golden State Warriors drama: Will it make or break the team?